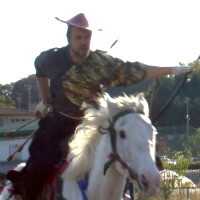 YABUSAME is a religious exercise performed in shrine precincts by mounted archers who shoot at three stationary targets 300m away while riding at a full gallop. They are allowed to use only three arrows, which they carry at their hip; in other words, they have only one chance to hit each target. As many of you know, TSURUGAOKA-HACHIMANGU in Kamakura is famous for YABUSAME. In the Kansai area, YABUSAME is performed at SHIMOGAMO-JINJYA in Kyoto, as a part of the Aoi Festival. At KASUGA-TAISHA, boys ranging form third graders to fifth graders take the role of archers in the CHIGO (a pageboy) YABUSAME in the December Festival. Though the practice is sometimes hard for them, it is performed with spirit every year. We are practicing on a wooden horse to polish our skills in riding horseback, pulling out an arrows and stringing the bow. You need lots of experience to practice this series of movements, including placing the arrow, stirring the bow and shouting, which you can never practice too much. The students are practicing really hard, according to the formal ritual followed by disciples of the Ogasawara-ryu Archery and Horsemanship Ritual. We all hope to see you at the festival.